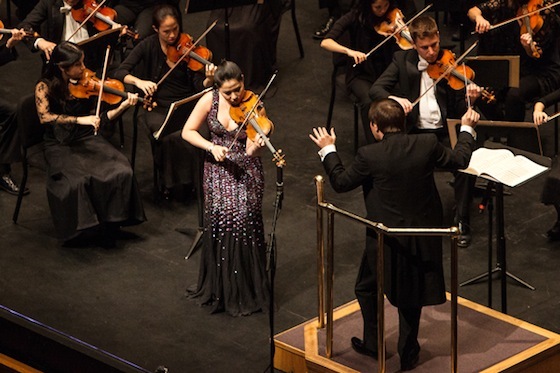 Violinist Sarah Chang wowed a near-full house Sunday afternoon in Santa Monica, Calif., with her energetic performance of the Bruch Violin Concerto with the New West Symphony, under its new conductor, Marcelo Lehninger. Dressed in opulent pink satin, she commanded all available space with her presence and sound. Literally, the stage hands cleared an unusually wide area in front of the first violins to accommodate the larger-than-life superstar, whose energetic motion had her walking about the stage, leaning near-backbends for high notes and whipping her bow in full circles at the end of musical phrases. Indeed, she performs with a sense of the theatrical, which encompasses not only the music but the full package: her demeanor, her motions, her attire. She played three performances of this concert, in Oxnard, Thousand Oaks, and Santa Monica, California. My moles in the New West Symphony report that she wore a different stunning dress every night. 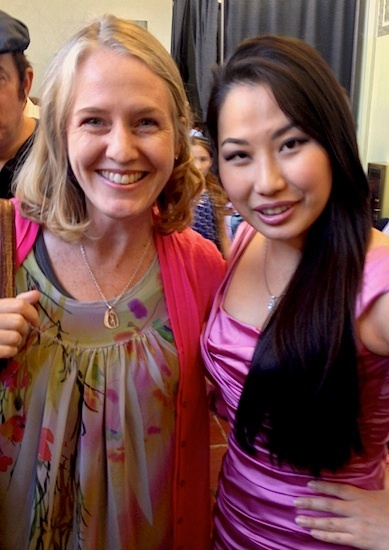 Sarah Chang, performing Saturday in Thousand Oaks (in another dress!) with the New West Symphony, with conductor Marcelo Lehninger. Back when I interviewed Sarah in 2009, she said, "a concert is an event. With operas, you have costumes and lighting, and you're telling a story, in a character. At a concert, you can basically wear whatever you want. But at the same time, you are, in a way, loosely representing the composer, and I think you should keep that in mind." The composer for Sunday's performance was Max Bruch, with his famous Violin Concerto in G minor. It's a favorite in the violin literature, and obviously it's an old friend to Sarah Chang. The Bruch is also pretty good barometer of an orchestra's fire; the simple orchestral accompaniment occasionally rushes full-tilt into lushly Romantic interludes with intricate string work and full winds and brass. New West met the challenge with enthusiasm. Sarah stood for these orchestral interludes with hand on hip, violin held by the scroll in her bow hand -- a force whether she was playing or not. The last movement went at quite a fast pace, Chang playing with muscular clarity and literally kicking up her skirt. The audience was fast to its feet for a standing ovation, though it did not receive an encore. 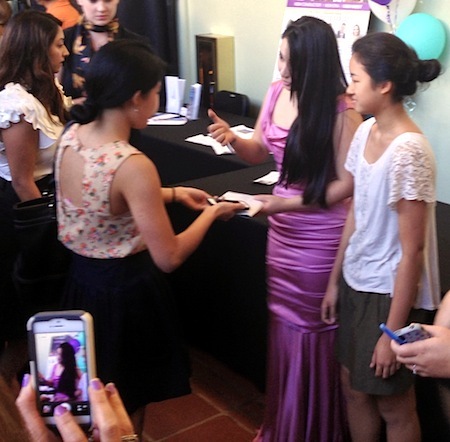 Sarah did greet her fans at intermission, though, generously signing autographs and posing for pictures. Before the second half of the program began, the orchestra's new conductor honored the orchestra's longest-playing member, Gladys Secunda, who was retiring from the second violin section after 19 years. She had been there since the inception of the orchestra. I found that simple acknowledgment to be rather profound and heartening: the new honoring the established. The second half definitely had a Latin American flavor, perhaps in honor of new conductor Lehninger, a native of Brazil. Works included the "Cuban Overture" by Gershwin; "Two Tangos" by Piazzolla and "Four Dances from Estancia" by Ginastera. More high-energy playing -- what a great way to begin a new era for this orchestra. Literally "kicking up her heels" is one of Sarah's performance trademarks. It also brings a bit more attention to her marvelous attire, since it also accelerates the hem of her dress. She is certainly a theatrically active performer.